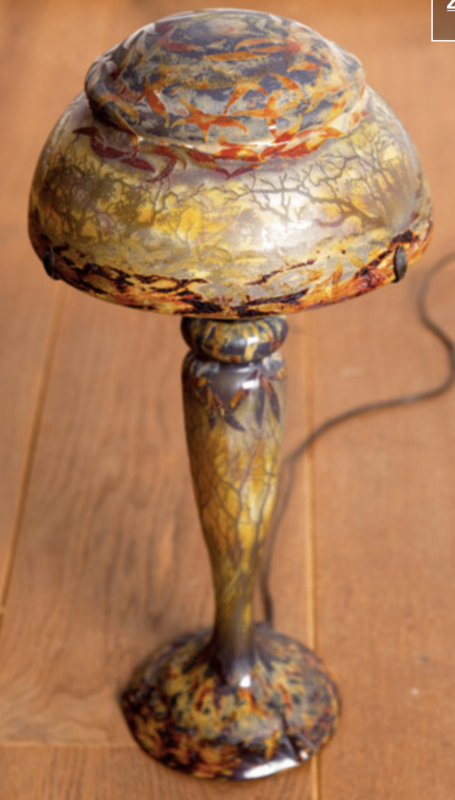 This is a very rare Daum lamp with impressionism. The trees are beautiful and the lamp is just gorgeous. It is a rare oppurtunity that we could buy such an impressive lamp. Ofcourse it is perfect. The hood is signed and the foot as well. when it is not burning, it is still beautiful. One of the rare lamps that is made with vitrification. Most lamps are acid-etched. Vitrification was used between 1900-1914 and consists in rolling the hot glass on the marver in particles of metal oxide or powder made of coloured ground glass and re-firing to achieve a smooth and highly polished surface in all different colours. The effect is further enhanced by polishing at the wheel. Patterns can be acid-etched or wheelcarved in to the textured surface. see page 82 of Daum by Noel Daum for a vase with the same decoration.